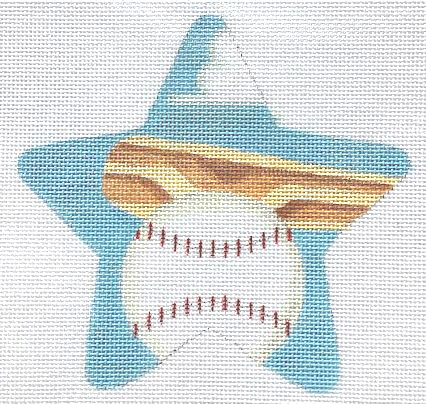 A baseball needlepoint star ornament by Raymond Crawford sold canvas only or with fibers. A perfect gift for the baseball player or fan in your life. HO1370. The design is hand painted onto 18 mesh needlepoint canvas and measures 5" in diameter. You can order this ornament design canvas-only or with threads - If you choose threads -t - we will send mainly silk and a smattering of metallic threads for holiday sparkle; for cotton we send DMC cotton floss.